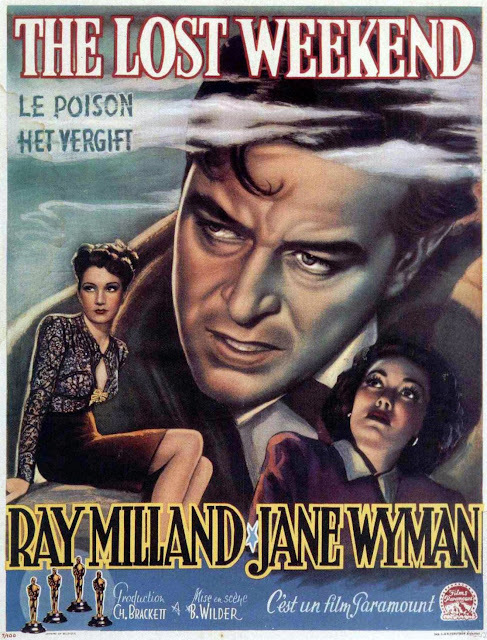 The Lost Weekend, is a film directed by Billy Wilder, based on a novel of the same name written by Charles R. Jackson. It won the Academy Award for Best Picture in 1946, and in the same year, was one of a dozen films that shared the Grand Prix (the highest award at the time), at the inaugural Cannes International Film Festival. To date, it remains, along with Marty (1955), one of only two films to win both of the top prizes at Cannes and the Oscars. 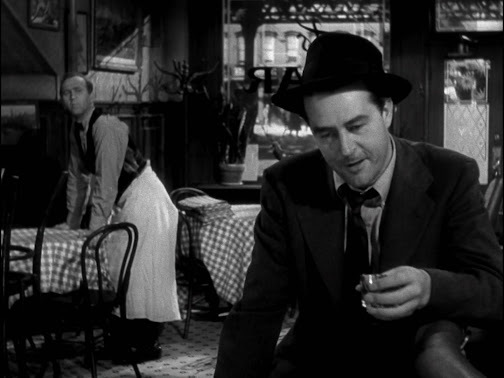 It is centered on the character of Don Birnam (played by Ray Milland, in a devastating role which earned him Best Actor trophies at the Oscars, Cannes, and the Golden Globes), a struggling writer in his mid-thirties who has a serious alcohol problem. Following him over the course of one long weekend, as he skips out on a planned trip upstate with his brother Wick (Phillip Terry), avoids his inexplicably supportive girlfriend Helen (Jane Wyman), and stays in the city, where he ends up going on a non-stop bender. Even though the power and impact of the film has been partially eroded by the passage of time; and outdone by the many incredibly realistic portrayals of addiction that have since been made, it still leaves a solid impression. 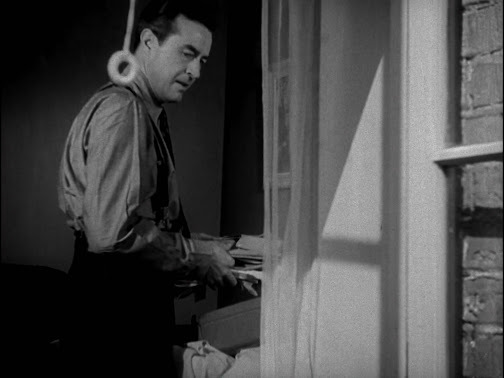 Credit mostly to the tremendous lead performance by Milland, who brings a sad cross between fiery determination and hopeless desperation to Don, and makes it impossible for us to look away from his gradual path of self destruction. But also to the dark cinematography of John F. Seitz, who captures a dour and gritty Manhattan, absent of all the usual movie glitz. 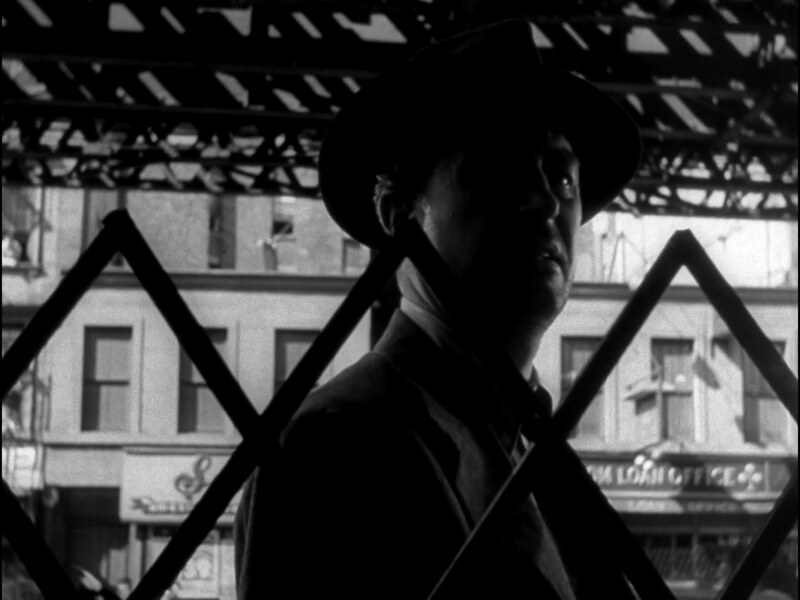 Through scenes that take us back, almost like a documentary, to a New York that no longer exists. This non-airbrushed reality is most evident in the sequence where Don wanders up 3rd Avenue in a futile search for an open pawnshop on Yom Kippur day. Past trolley buses, street vendors, and shuttered storefronts, all under the grim shadow of the now long gone elevated train. A heartbreaking sequence to watch, but it also serves as a fascinating journey back in time. The supporting players are also worth mentioning. Terry as the long suffering brother, Wyman as the näive girlfriend, and a young Doris Dowling as a bar-girl who has a crush on Don. The roles are mostly stereotypical, and their actions dated, especially the female ones, but all of them are given well written characters with distinct personalities that do enhance the screenplay. Worth seeking out, even if you might not be a fan of classic films. The Lost Weekend is more than just an historic curiosity, it is also a very good film. One with fine acting, confident direction, and an emotionally stirring story. I still haven't really thought about how I feel about the ending because I wasn't exactly on board with it but I like you saying inexplicably supportive girlfriend, though I will call her persistent than naive, as that is what my problem was - why is she still with him ?? But no doubt Ray Milland was superb in it. There are very few scenes as devastating as that Yom Kippur sequence you mentioned. All round, a great film indeed. 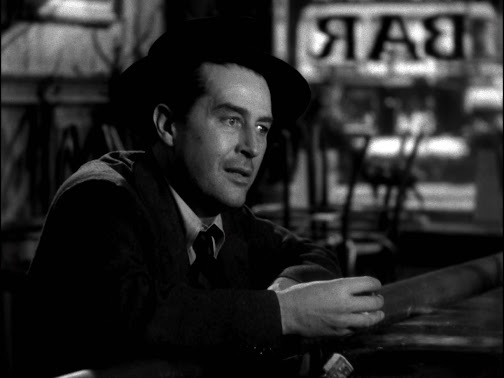 This film really left an impression on me, but mostly, as you already mentioned, for Ray Milland's performance. I'll search for it only because you recommend it, because it seems like an average watch among good films. I don't think the ending is really conclusive either way. It could be seen as the end, or the beginning of another vicious circle. I understand the brother sticking with him, but the girl was a bit of a stretch. 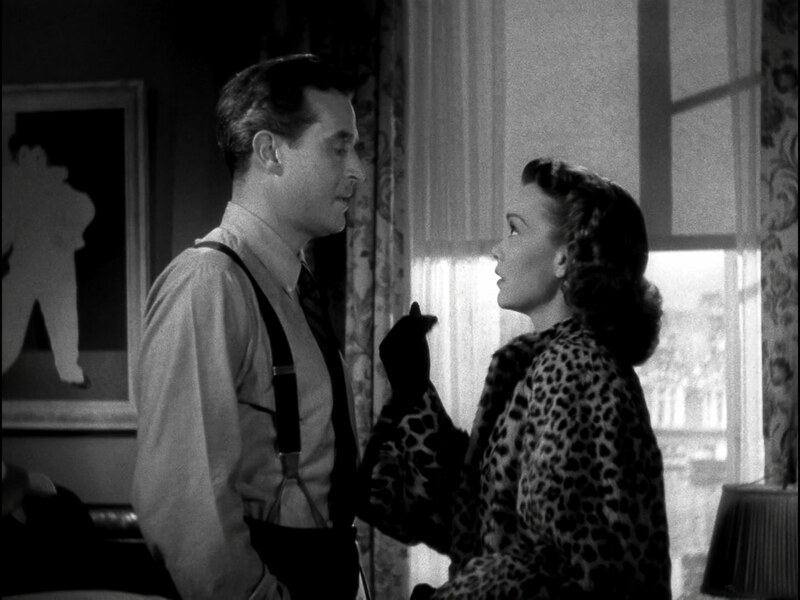 Still those kinds of characters I've come to expect from old movies, so it's not enough to derail the film for me. Thanks for stopping by SDG. 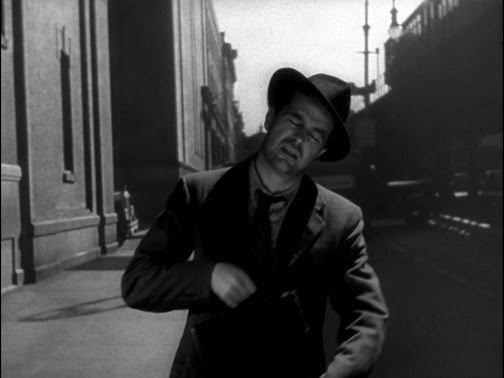 Yeah Milland, and those images of old New York are probably what will stick with me. Nice of you to pop by again Christine. 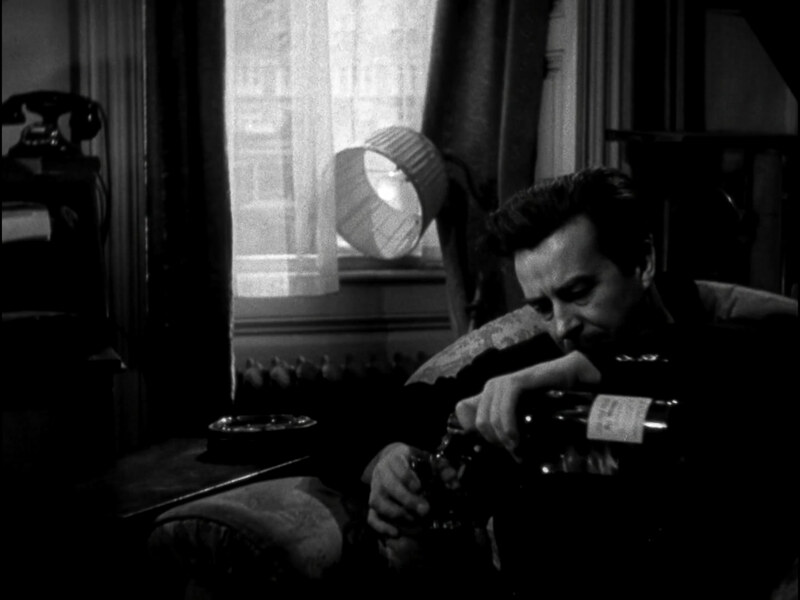 I haven't got to all of Billy Wilder's best work yet, with those huge award wins I'm adding The Lost Weekend to my queue. Yeah, Wilder was brilliant and could direct any style of film perfectly. I agree Some Like it Hot is one of the great comedies, but I think Sunset Blvd. is my favorite of his works. I was lucky enough to catch this in the theater last month. I agree that this is a great, albeit depressing, film. 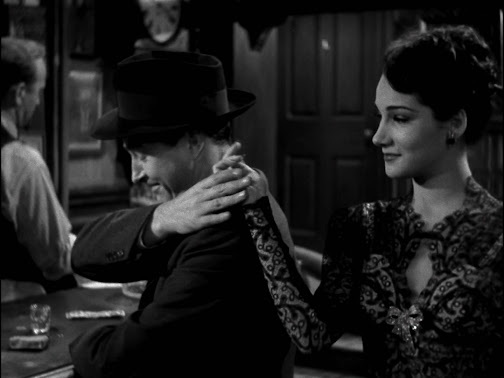 One of Wilder's best. Nice, it's been awhile since I got to see a classic at the theatre. I should try and do that more often. Thank you for mentioning the scene where he is trying to find a pawn shop. That scene, more than any other, showed just what it is like for an addict who is searching for their fix, and the lengths they will go to. Yeah, rarely has that ever been done so well. Even the recent film that everyone is in love with, Shame, never captures that feeling as well as this scene does.